Early computer models have predicted below-par temperatures and frequent spells of wet weather could be heading for Britain, potentially wrecking our hopes of a long, hot summer. Are we in for a wetter than normal summer? Yorkshire has shivered through the winter with the Beast from the East and the Pest from the West storms bringing heavy snowfall and freezing conditions to the county. One weekend of sunny spring-like weather in mid-April had whetted our appetite for more sunshine, but a return to colder temperatures at the end of April was not long in coming. Of course, the British summer is rarely well behaved, but predictions that temperatures will be lower than average and rainfall higher than average are bound to cause disappointment. Dr Todd Crawford, chief meteorologist at The Weather Company, said Spring had finally arrived but that temperatures would remain below-normal for the time of year. Heavy rains are predicted across areas of Britain on Monday, while there is also expected to be a touch of frost on Tuesday morning as temperatures drop to 3C. 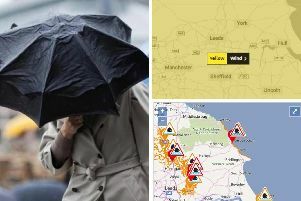 The eastern coast of Yorkshire is likely to see the worst of the weather as we move through the start of the week. There is, however, hope for the coming week as clearer skies and lighter winds are predicted... even if the showers are set to remain.